The Phillies are going to be making a change in their rotation with Jerad Eickhoff taking over for Nick Pivetta, per Matt Gelb of The Athletic. The Phillies are in the process of making a roster move. Nick Pivetta will be optioned. Jerad Eickhoff is in the rotation. Pivetta, 26, was a popular pick to have a breakout season during spring training, but he's been touched up pretty good through four starts in this still-very-young season. He's pitched to an 8.35 ERA and 2.13 WHIP in 18 1/3 innings. He leads the majors with 31 hits and 17 earned runs allowed. He's also coughed up five home runs. The Phillies are 10-6 and in first place, but that hardly means they have the time to be patient while Pivetta tries to figure things out at the big-league level. The Mets are 10-7, the Braves 9-7 and Nationals 7-8 in what is one of the most competitive divisions (at least 1-4) in baseball. This means they'll turn back to Eickhoff. 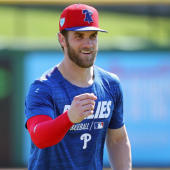 He was in the Phillies' rotation in 2016 and for most of 2017, but since late 2017 he's battled numbness and an assortment of other injuries. His first big-league outing of the season came Tuesday night in mop-up duty, when he worked four scoreless innings, striking out six while not allowing a walk. In the outing, he relied exclusively on a fastball, curve and cutter. In the past, he's also worked in a slider and change during his starts. The next turn for Pivetta in the rotation was set for Sunday, April 21 in Colorado, so that'll be Eickhoff's spot now.